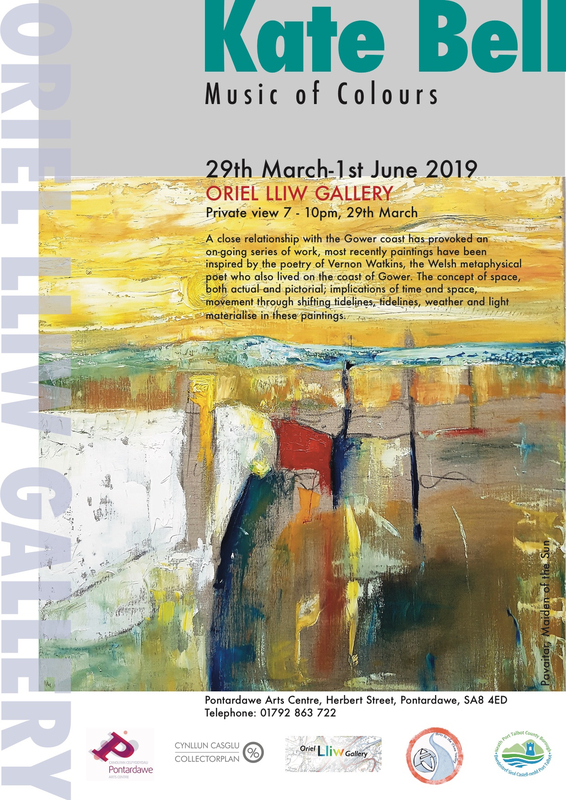 A close relationship with the Gower coast has provoked an on-going series of work, most recently paintings have been inspired by the poetry of Vernon Watkins, the Welsh metaphysical poet who also lived on the coast of Gower. The concept of space, both actual and pictorial, implications of time and space, movement through shifting tidelines, weather and light materialise in these paintings. 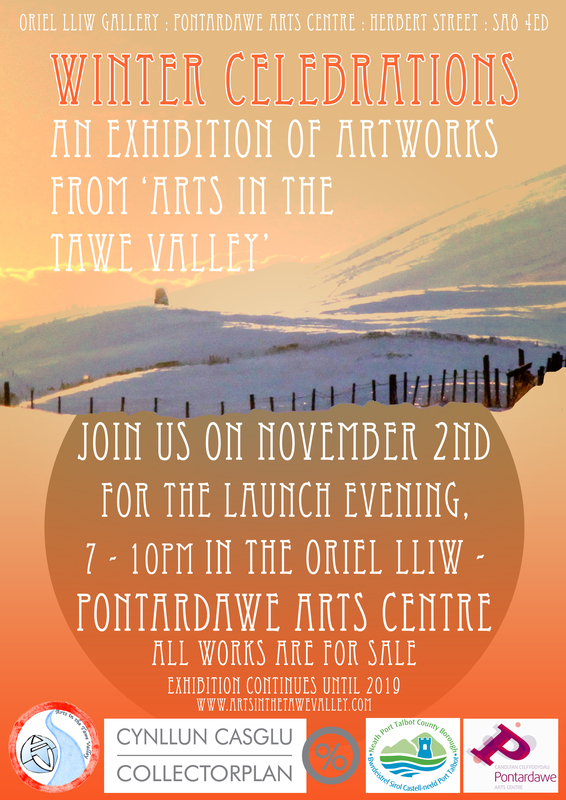 Our Winter Celebrations Exhibition from Arts in the Tawe Valley members will open on 2nd November at 7pm and celebrate the winter season with a variety of works. All works are for sale and we look forward to seeing you either at the opening or during the exhibition. Private View August 24th 7pm all welcome. 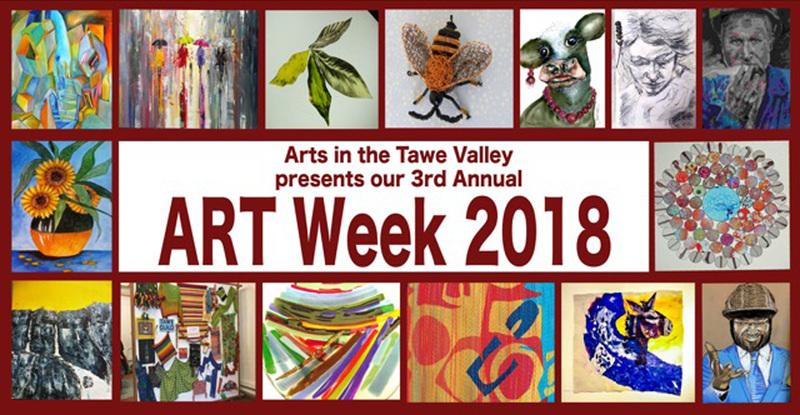 This year’s Art Week will take place from the 22nd June to the 1st July 2018. 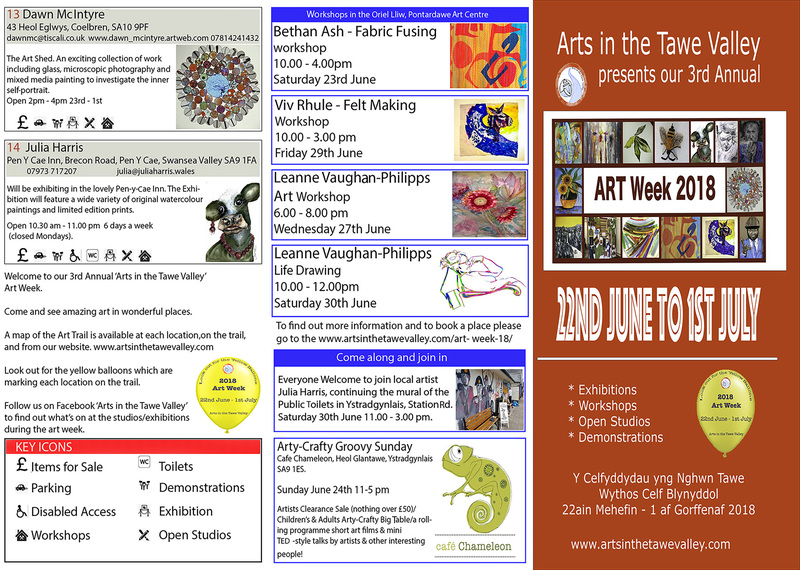 Please see the programme below with all the exhibitions, workshops and other arty happenings during the week. 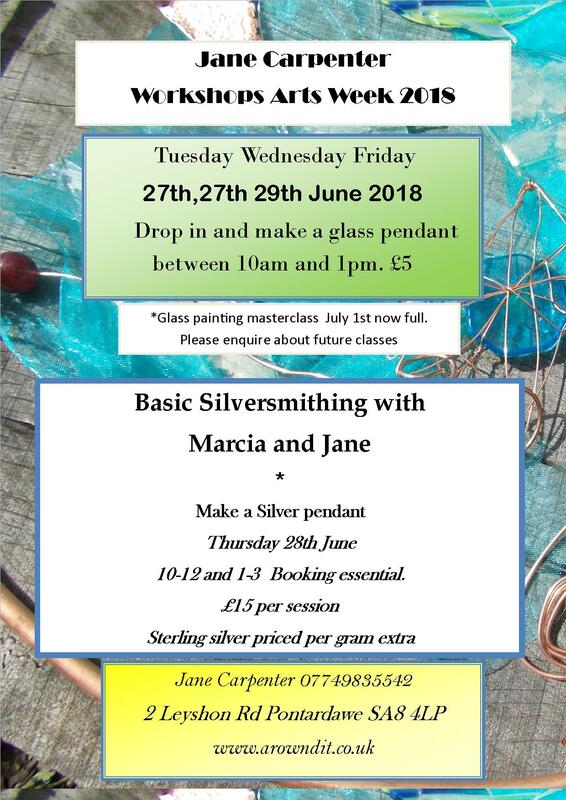 Please click on the leaflet to see a larger image. “When I paint I feel my heart opens with a love of life. I’m deeply inspired by nature and I’m passionately driven in developing uplifting paintings that are enriched with a positive and energetic vibe. Every morning I awake full of gratitude to be able to follow my heart and paint and can’t ever imagine my life without painting. My inspiration comes from my childhood, nature, flowers, bird watching, long walks, the changing seasons, exploring forests, gazing at the stars, climbing mountains, meditating, swimming in the sea and lazy days in wild meadows. I have an ever-evolving gallery of paintings from welsh landscapes, wildflowers, forests, butterflies, nature and the sea. 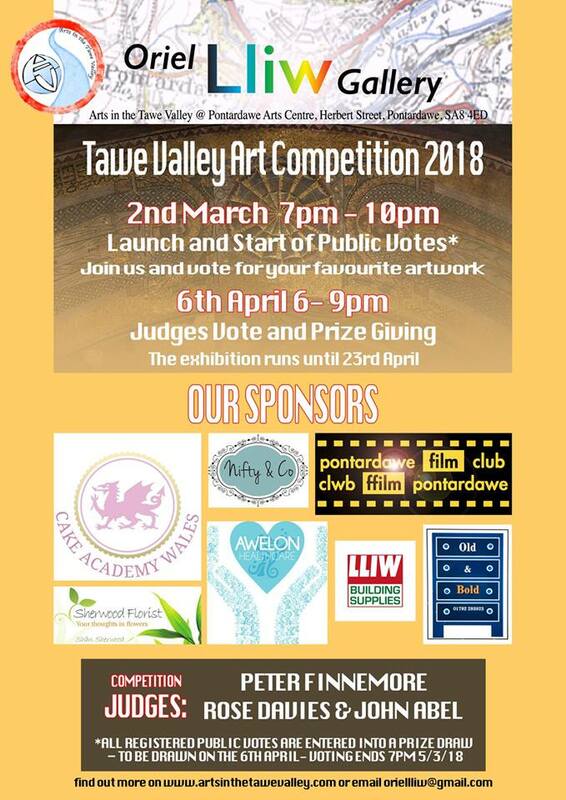 Arts in the Tawe Valley’s annual art competition begins on 2nd March from 7pm – 10pm at the Oriel Lliw Gallery in the Pontardawe Arts Centre when the public voting begins. 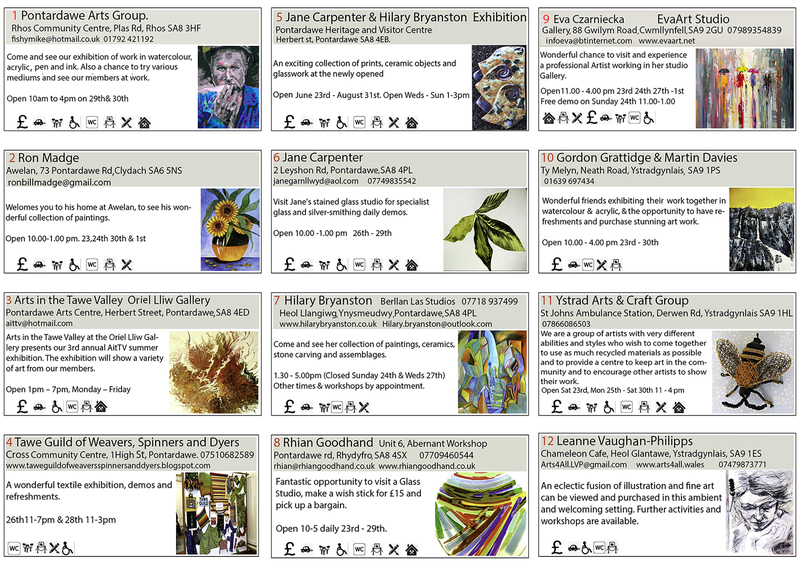 You have until the 6th April to view the work and vote for your favourite pieces. On the 6th April the judges will be voting and prizes for all the winners will be awarded. 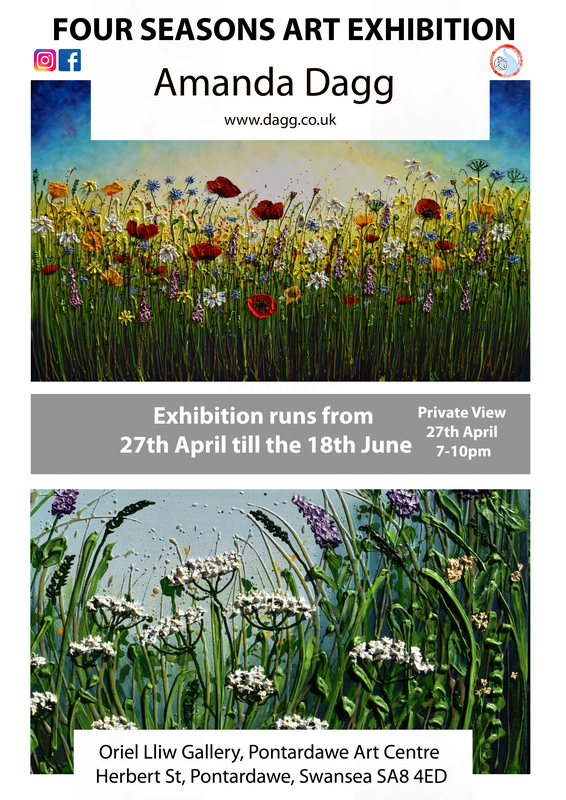 The exhibition runs until 23rd April. Peter Finnemore, Is an artist working within photographic art, multi media installation and video. 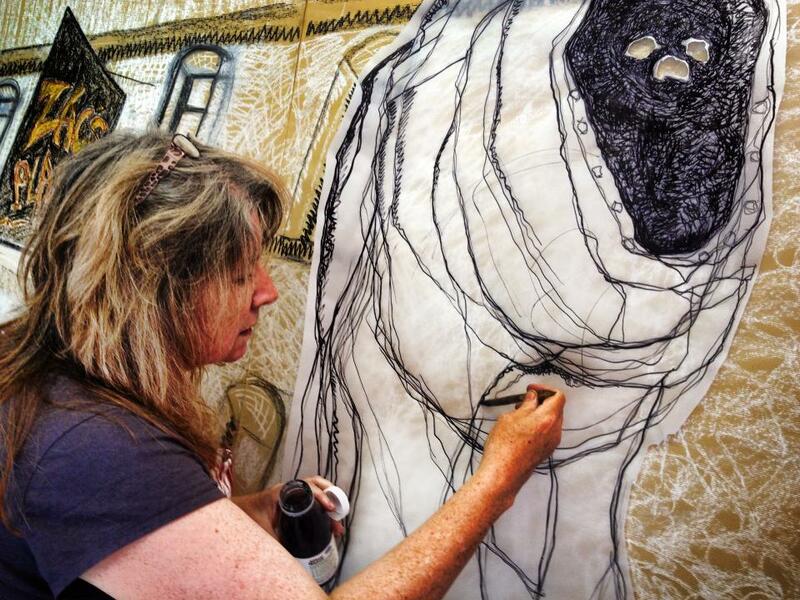 He has represented Wales in the Venice Bienale and won accolades in the National Eisteddfod. 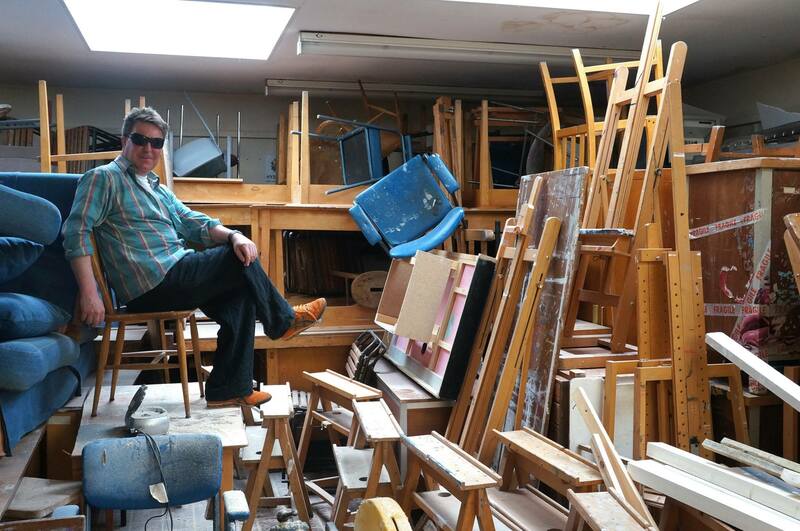 His work is in public and private collections in Wales, Scotland, England, Belgium and the USA. He is artist, lecturer, visiting professor and all round ‘good guy’. 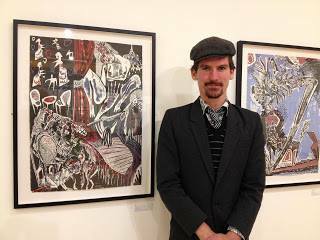 John Abel – John is a prolific painter and print maker ‘My aim through work is to represent human feeling as honestly as I can with no intellectual mediation, in an effort to understand myself.’ Abell was born in Cardiff in 1986 and graduated from Camberwell college of art + design in 2009. He has exhibited widely and his prints + publications are included in museums, libraries + national collections worldwide, including the Victoria & Albert museum, National Museum of wales, the British Museum, the National Library of Australia, the National Library of Canada and Columbia University library, new york. We are very happy to welcome him! Below is a gallery of the work in the competition. 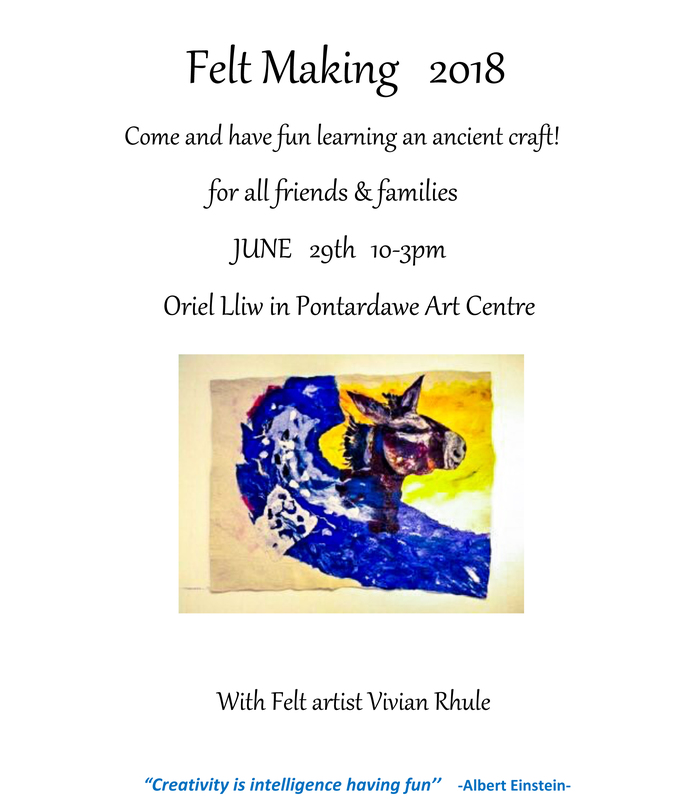 Drop by Oriel Lliw and vote for your favourite. Photos by Sandeha Lynch. 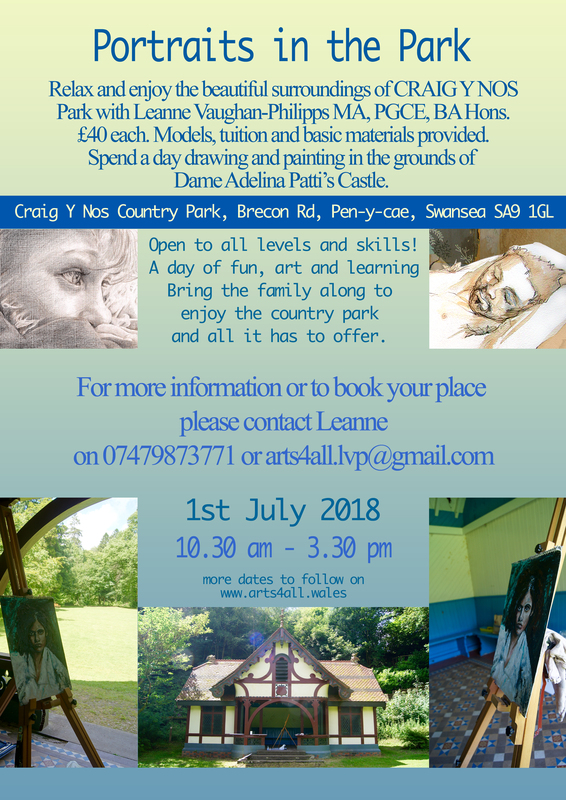 Thanks to our Sponsors: Cake Academy Wales, Nifty & Co, Pontardawe Film Club, Awelon Healthcare, Lliw Building Supplies, Sherwood Florist and Old & Bold. Like our event on Facebook and to be kept up to date. ‘Hidden Voices’ an exhibition by Eleanor Flaherty & Paul Steer is opening at the Oriel Lliw Gallery on Friday 12th January at 7pm. 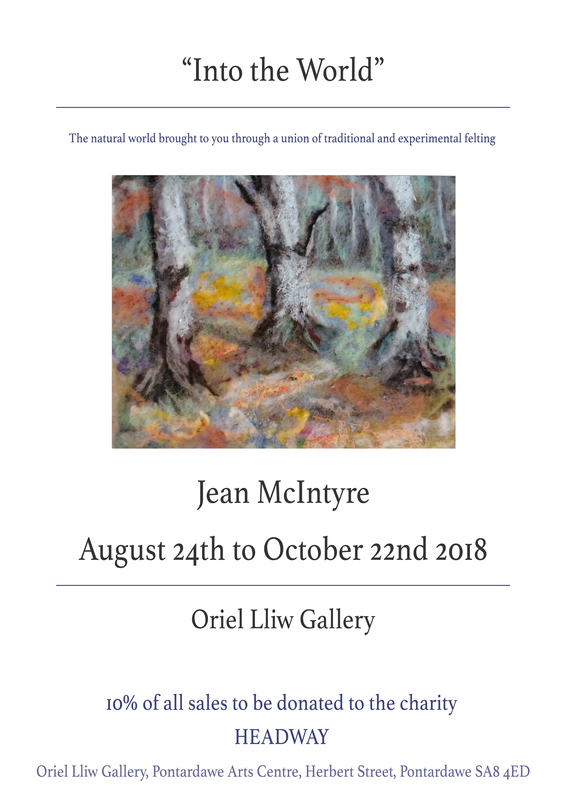 This multimedia exhibition has seen the Artists exploring the western Brecon Beacons, from wooded valleys to the remains of industry and the dark underground world. 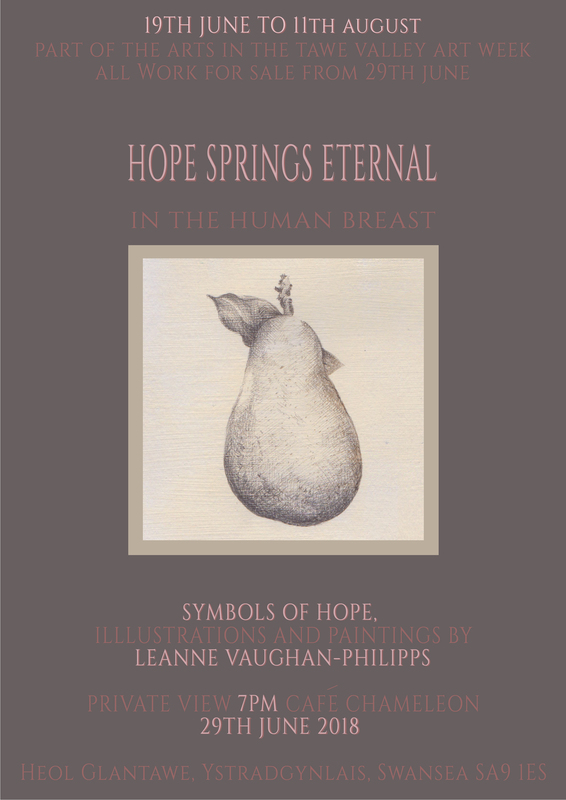 Books and postcards of the exhibition will be available to purchase from the Gallery.